Wow! I just looked up 'FOOD' in the thesaurus. Do you think if I start to use some of these terms, it will have less calories?????? Anyway, I'm concerned about my intake of pabulum over this coming weekend. There is going to be a lot of viand at the MainStreet Halloween activity in my little town tonight. Then, I'm going to go with friends to Hill Diner for some tuck. Afterwards, I'm meeting other friends at DeColores for wine and probably some more comestible. I don't think I will gain any weight because I don't even know what I'm saying!! No really, I do think it's time for a Halloween plan. 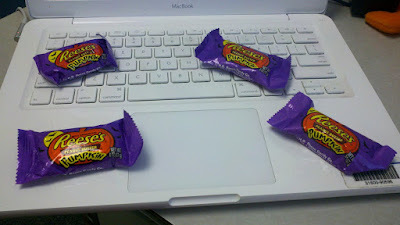 Today, my Boo Buddy at work gave me candy. And not just any candy (which I've told you I can turn down), but my favorite LITTLE PUMPKIN SHAPED REESE'S PEANUT BUTTER CUPS!! This is after I gave most of them away. And then, I gave these four away. Thank you, Marlene, for taking the last four off my hands. Not a single one of them touched my lips. However, I don't if I can keep this up. Tonight at MainStreet Halloween: NOTHING!!!! I have to remember that I CAN TURN DOWN CANDY!!!!! If there is some fruit, I can have that. I can have hot tea at Starbucks. Tonight at Hill Diner: Cup of Texas chili. Side salad. I don't even need to look at the menu. I shouldn't look at the menu. Please, no one even GIVE me a menu. I really want a bowl of Texas chili instead of a cup. I will stop at a cup. Tonight at DeColores: Two glasses of wine. Salsa. No chips. I eat there so often they know to bring me salsa with a spoon rather than chips. So that part is safe. Tomorrow, Nina is coming home. She is the ultimate skinny eater. Her favorite meal is salad and she stops when she gets full! She's one of those people who forgets to eat! She would also love it if we took a walk or did some kind of exercise. She is my #1 supporter for weight loss. Tomorrow lunch: Turkey sandwich at Subway. Nina and I like Subway. Tomorrow dinner: I'm going to let Nina order for me. She will order me something healthy and good. She could be someone's lifestyle coach. Sunday, Nina will leave and I will be blue because it's the day before Halloween. Blah, blah, blah. Sunday lunch: Eggs and toast. Sunday dinner: I'm eating at Hill Diner again. This time with Karen. I'm going to have the chicken breast with broccoli and a salad. And ketchup, of course. Can I actually plan this far ahead? Monday will be Halloween. I'll be back at work and safe from everything but the candy. I'll have my usual yogurt for breakfast, Lean Cuisine and a veggie for lunch, and..... I don't know about dinner. I just need to keep them on all weekend. Ok Jen~tough LOVE! Stop obsessing about food. Find a new passion(purpose)yougurt is just not enough after you have not eaten for many hours. And yes you can have a treat but only after you exercise. So walk or gym or swim.....and you would love water zumba. We should go when u r down! And stop making others in charge of your eating YOU YOU YOU!!!!! and only you are in charge. I hope this did not come across as mean spirited. I love you...I do! You know. I really feel like I need to "obsess" about food right now. Maybe not obsess but be the opposite of unconscious. I am not a person who plans. I like spontaneity. But, at this point in my life, I feel like I need to plan and put boundaries around my eating. At least right now, at this moment. Makes me thing about Ram Dass. Be Here Now. I would like to stop obsessing. I will learn. But, right now, what would I blog about if I didn't blog about food and eating. That is the purpose of this blog. But I do LOVE the idea of water zumba! I wonder if they have that here in Los Alamos. I'm going to call the Aquatic Center tomorrow and find out. In the meantime, I'm following my inner voice. My "gut" if you'll excuse the pun. Love you. I appreciate your tough love, Anonymous. I need all I can get. Even if I say no. Yeah, I'll vouch for that, knowing you as well as I do. You get into more trouble when you are not paying attention to what you are taking in. I think you are doing a great job keeping yourself accountable. Since you are such a social creature, it makes sense for you to recruit supporters to help you along the way. Eventually, the new healthier behaviors become natural and you won't have to pay as much attention to it. Keep up the good work my soul sista! What in the hell am I doing? DON'T READ IF YOU EMBARRASS EASILY OR HAVE GOOD VERBAL BOUNDARIES OR IF YOU DON'T LOOK PREGNANT WHEN YOU AREN'T! I'm fat. I'm tired of being fat.